Having actually done this, I can honestly say it takes a lot of confidence to go that high on a jetboard. I managed a few feet off the water and was glad to have the helmet when I inevitably hit same water. The thing about falling on a jetboard is that you must take the impact flat, otherwise the thrust drives you into the water. The last thing you want is to hit the water with the jets pointing up! 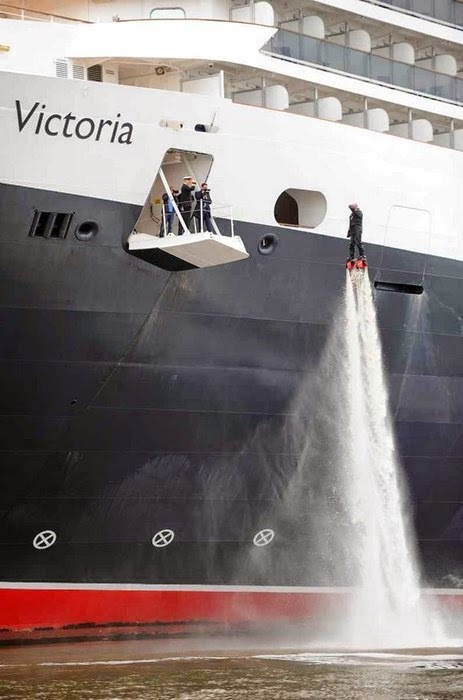 The daring in the photo below is that if he lost control, at best he'd be looking at a 40 foot flat hit upon the water.